In the previous post we transformed the CustomersApi application a little bit. We added a customer repository and a customer service. We also transformed the Get action method of CustomersController into an asynchronous one. In this post we’ll get rid of this direct control over the controller dependencies. Instead, we’ll let an ICustomerService object be injected into the controller through its constructor. We let the consumer of CustomerService provide an implementation of ICustomerRepository. We want to do the same for CustomersController. The consumer of the controller should provide an implementation of ICustomerService. However, where do we provide that implementation? Where is the caller to CustomersController? It probably lies hidden within .NET and its MVC routing logic. Fortunately for us this is not a new problem and has been solved using Inversion of Control (IoC) containers. IoC containers are typically quite complex mechanisms that can “magically” construct concrete implementation of abstract dependencies on the fly. There are many IoC containers out there for .NET and one of the most popular ones is StructureMap. These are all auto-generated files. 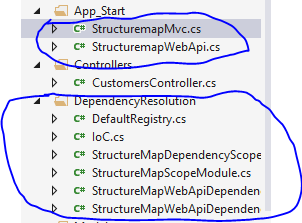 In fact the installer also added MVC-related classes, such as StructuremapMvc.cs. We won’t need all of those. Also, as we started with an empty application originally you’ll see a couple of build errors. The StructureMap package we’ve installed expects a couple of standard assemblies to be available in the list of references. We have an additional problem. We installed Helios in this post through NuGet. Helios and StructureMap don’t work well together. I’ve tried to have both Helios and StructureMap in the demo API but haven’t found a good solution. Maybe there’s some kind of a solution out there. We can probably expect a StructureMap update later on when Helios goes live. 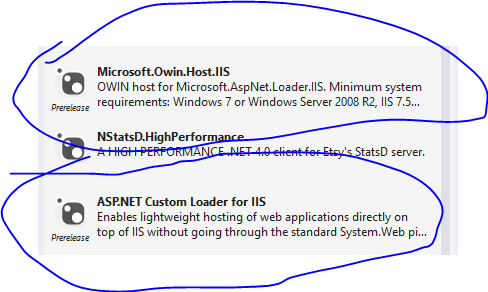 Also, StructureMap won’t work with OWIN self-host so make sure you set IIS as the deployment platform. I’m not an expert of IoC containers so I’m not sure how to make StructureMap work with the OWIN self-host and Helios. If you know more then you’re welcome to provide your solution in the comments section below. Next you can safely delete both classes in the App_Start folder. Delete the StructureMapScopeModule class from the DependencyResolution folder as well. We initialise the IoC container. We also want to be certain that all the abstract dependencies have been resolved to a certain concrete implementation. So for ICustomerRepository StructureMap found an implementation called CustomerRepository. Similarly, ICustomerService was resolved to CustomerService. The default convention for interface abstractions is that if StructureMap sees an interface whose name starts with an “I” then it will look for an implementation with the same name without the “I”: ICustomerService – CustomerServicer, ICustomerRepository – CustomerRepository. Note the usage of For and Use in the DefaultRegistry constructor. If you run the application now you’ll see that both ICustomerRepository and ICustomerService are resolved correctly by StructureMap and the customers list is retrieved from the repository. This is the last post of this short intro to Web API 2 with OWIN. We’ll take up some security extension options in Web API 2 in the next series. Great and very insightful posts, thank you! Good read, is there a link to download the source ? nice post, i think you have a typo.